Every winter, monarch butterflies in Canada and the northeastern and midwestern United States flock to the pine and fir forests of central Mexico to hibernate, covering trees and turning hectares of forest orange and black. This year, the butterfly population overwintering in Mexico more than doubled, according to World Wildlife Fund Mexico, which helps lead the annual count. The butterflies covered 6.05 hectares of forest, up from 2.48 last year. It’s the largest wintering area since the winter of 2006–07. 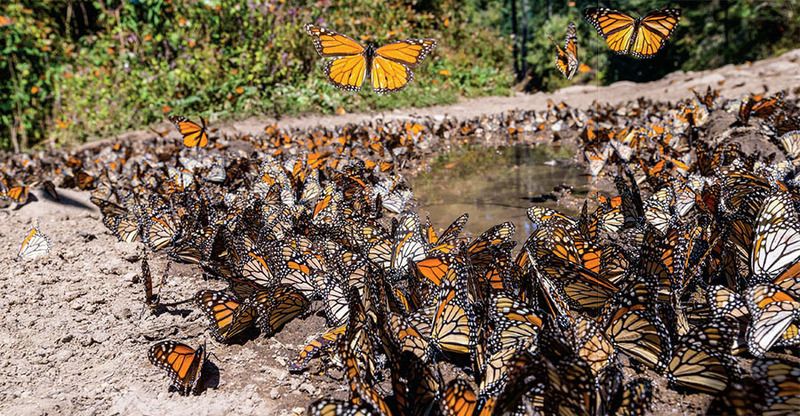 This famous group of migrating monarchs has been struggling in recent years, with an all-time low arriving in 2013–14, when they covered a mere 0.67 hectares. This year’s uptick reflects a boost from mild climatic conditions in the United States last year, which allowed more monarch larvae to survive and mature there and eventually make the 4000-kilometre journey to Mexico. Another possible cause: Increasing numbers of Americans have planted milkweed, monarch caterpillars’ food source, which has been threatened by the widespread use of herbicides in U.S. agriculture. Meanwhile, the population of monarch butterflies that lives west of the Rocky Mountains and overwinters on the California coast continues to decline, with an 86% drop reported this year.